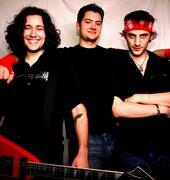 Made up of Matt Bresolin (guitar), Daniel Mendygral (drums) and Ryan Beveridge (bass/vocals), Ironhide first formed in 2005 during the latter stages of the members' high school years. Taking inspiration from eighties metal such as Van Halen, Extreme and Iron Maiden the trio mainly played locally, scoring a few gigs in Sydney also. In 2007 Ironhide placed 2nd in the Leichardt Live band comp, and the band used the proceeds to enter the studio to record their self-titled EP. Later the same year Ironhide were finalists in both the UniBar and the Mercury-Bluescope band comps. David Clowry briefly joined the trio as lead vocalist as the band experimented with their stage presence. It was a short-lived experiment however, and Ironhide soon returned to a three-piece. Clowry's vocals can be heard on the two tracks recorded live at the Oxford below. Ironhide disbanded in 2008 and Beveridge went on to play in Bennie James and the Hesitant Few, and currently fronts Order 66 which he formed with Bresolin before the guitarist left for other pursuits. Thanks to Ryan Beveridge for helping piece this history together.